GTCC’s annual career fair is free and open to job seekers. JAMESTOWN, N.C. — Guilford Technical Community College will host its annual spring career fair on Wednesday, March 21 from 10 a.m. to 2 p.m. at the Medlin Campus Center on GTCC’s Jamestown Campus. This free event offers job seekers the opportunity to network with employers from a range of industries. “This highly anticipated event is part of GTCC’s mission to provide workforce development opportunities to Guilford County employers and job seekers,” said Carolyn Salanger, director of student success and retention at Guilford Technical Community College. The 2018 “Let’s Get to Work” Career Fair will include employers spanning healthcare, manufacturing, automotive, logistics, law and more. 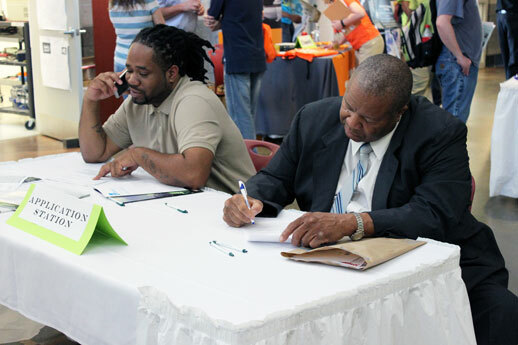 Last year’s event attracted nearly 100 companies and approximately 1,800 job seekers. Bring Plenty of Resumes: Have several copies of your resume on hand; use bullet points to describe your skills and past experiences so employers can easily scan your qualifications. Dress to Impress: No matter what type of job you are applying for go above and beyond to get an employer’s attention. Dress professionally, wear comfortable shoes and remember to go easy on the perfume/cologne. You don’t want to do anything to distract the employer’s attention from your skills and positive attitude. Research Participating Companies: Review the list of participating employers and their recruiting needs. Use this information to identify which employers you’re most interested in learning about at the career fair, locate their booths and plan to meet with them first. You want to use your energy on your top choices first. Develop a Sales Pitch: Prepare a 30-second elevator speech to sell your skills to prospective employers. Arrive Early: Some employers may be unable to stay for the entire event, so don’t miss your opportunity to meet with them. Don’t Loot the Booth: Don’t take too many of the employers’ promotional items. Be Positive: About 70 percent of all applicants are hired through networking, so do not get discouraged! Bring your positive attitude. The 2018 “Get to Work” Career Fair is a free event and open to the public. For more information, call 336-334-4822, ext. 50169 or click here for a list participating employers. Guilford Technical Community College is the fourth largest of 58 institutions in the North Carolina Community College System. GTCC serves more than 34,000 students annually from five campuses and a Small Business Center. Learn more at www.gtcc.edu.